Claire's Diary writes songs that could have been lifted from your old journal. As a child, I was an avid journaler. I'd document the most mundane aspects of my life in my diary but would always put a lock on it to make sure my parents or younger brother couldn't take a peek at my really serious musings on dance class. I have about ten diaries ranging from ages seven to fourteen boxed up in my basement and I know I'm not alone in this – before the age of Xangas and Livejournals and Tumblrs we had to write all of our thoughts out in cutesy notebooks. The concept of a diary is still very endearing to me so I was excited to see someone utilizing it in a band name. The name Claire's Diary came to be when the members of the band discovered a diary in a meadow that belonged to someone named Claire. The supposedly brought their findings in the diary to life through music. Whether this story is true or not (I'd like to believe it is), it was a wonderful chance that members Sophie, Isadora, Joey, and Kiri came across this diary because together they make some straight up, punchy rock music that's been lifting me out of my post-grad induced summer slump. Using the word "rock" to describe a band can be conflicting since it spawned so many different subgenres but it's the best way I can try and pin down Clarie's Diary's super catchy songs bursting with pounding drums and guitar riffs that sound like they could make your fingers fall off. Their first self-titled album, which came out in February, never calms down from the beginning to the end. Claire's Diary opens with the bouncy "Suzy's Alright", which was Rookie Magazine's theme song back in October of 2011. I rambled about journals earlier on because Claire's Diary reads like a personal diary. "Suzy's Alright" is about the stupid drama you face in high school and "Girl Next Door" sheds light on what the mysterious girl next door could be doing behind closed doors. There are ten original songs on the album (did I mention theres's also a Shangri-Las cover? swoon) convey feelings and frustrations that anyone has felt in life, especially those of us that used to document all of them in writing. When vocalist Sophie sings, "Sometimes I get frustrated waiting for my life to start" on the rollicking pop-punkish "In the Dust", it basically sums up exactly how I feel at this moment in time. My all-time favorite on the album though is the hilarious yet very accurate "Western Mass", which tells the tale of a fleeting romance with a deadbeat dude that ends in an arrest. The chorus goes, "I went to Bed Stuy for you but you went back to Western Mass / I lied to the police for you but then you went back to Western Mass." Even though the story is pretty specific, everyone has had those seemingly-cool but actually pretty lame crushes that make you do stupid things. Also, while I was listening to them my friend said they sounded like Josie and the Pussycats. I think that's enough to give them a listen. 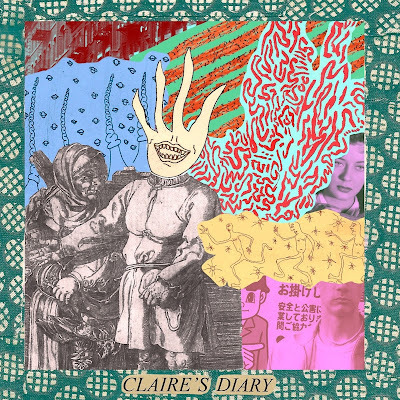 Listen to Claire's Diary on bandcamp.